Surprisingly Dutch law doesn’t state how wide a bicycle path should be. But even though there aren’t any legal requirements there are some very strong recommendations. One of these recommendations is the design manual “Tekenen voor de fiets” which in Dutch is a pun and means both “Designing for the bicycle” and “Committing to the bicycle” thus making clear that cities and towns following this manual make a deliberate pro bicycle choice and commit to take cyclists’ safety seriously in their municipalities. Each municipality follows its own rules. 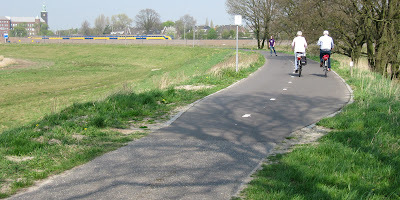 At the border between two municipalities this cycle path doubles in width because of that. The manual mentioned above states that a one way separated (protected) cycle path should not be narrower than 2 meters (6.5Ft). This was calculated as follows. Under Dutch law the maximum width of a bicycle is 75 centimetres (roughly 30 inches). But a cyclist can never ride in a completely straight line. Cyclists will always move sideways slightly. The distance they move from their straight line depends on skill, speed, age, experience and the weather but is set to be 25 centimetres (about 10 inches). That would equal an absolute minimal width of 100 centimetres (about 3 feet or 40 inches). But there are more factors that need to be taken into account. There is what is called the ‘shy-factor’ that indicates needed space around obstacles (pot holes, debris, bollards) but even the shadow of the kerb is a factor. Also important; the Dutch feel that cyclists should be able to ride two abreast. Not only because cycling is a social activity but especially because that means a parent is then able to ride next to his/her child. To top it all off, it must be possible for other cyclists to overtake these two riders. All this leads to that minimum of 2 meters. 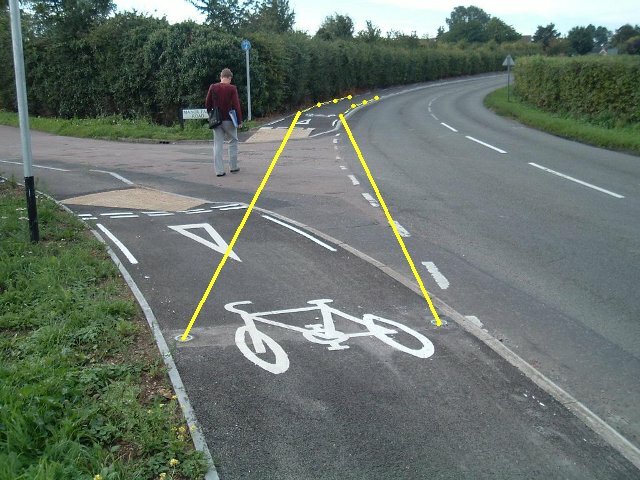 But when a cycle path sees over 150 bikes per hour, that minimal width goes up to 250 centimetres or 8.2Ft. For rural bicycle paths the manual advises to have an additional space between the cycle path and the road-way of 50 centimetres (20 inches) that has to be free of obstacles (like road signs or trees). Just like cycle paths there is also no law for the width of cycle lanes. It is believed they can be a bit narrower than paths because if necessary it is possible to swerve out of the way of obstacles into the road-way. That is why another recommendation, the “Handbook Road design” (for rural roads) gives a minimal with of 125cm (almost 50 inches). The Cyclists’ union feels that should have been at least 150cm (almost 60 inches) and such lanes should never be next to parked vehicles. Most cities follow the Cyclists’ Union or go further. The cities of Utrecht and ’s-Hertogenbosch both state a minimum of 2 meters (6.5Ft) for their (new) cycle lanes in their own road policies. Let’s see what all this means in reality. So the recommendations are actually followed very well. Why is that? Because cycling is so normal in the Netherlands and almost everybody is at one time a cyclist, the public pressure to create good cycling infrastructure is enormous. The authorities in charge of the roads and streets feel obligated to stick to the recommendations. But there is another reason: liability. The Dutch Civil Code states that authorities in charge of roads and streets carry a large responsibility for the state of their roads and cycle paths. Article 6:174 states that they have to compensate damages a road user suffers because of a poor state of a road. 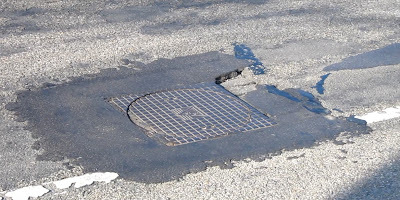 Even though this means that a cyclist would have to prove that a road was in such a poor state that his or her damage is a direct result of it, it is still a strong incentive to keep the roads in a perfect state of maintenance. 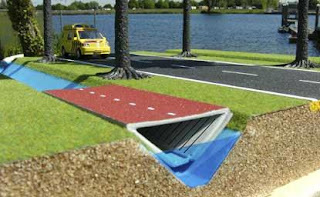 And while you are doing maintenance it is easy to keep the design of the roads up to the latest standards as well. Raalte - a town without "clearly visible reasons" for its high cycling rate ? 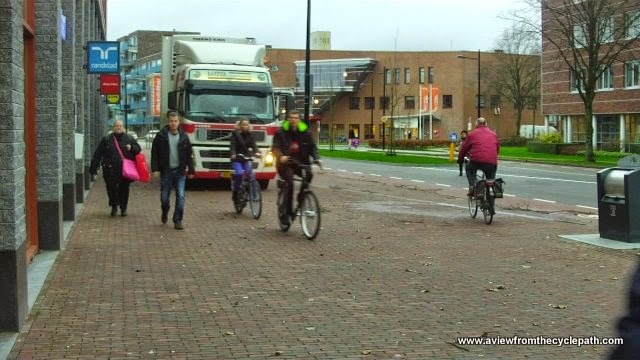 A new Fietsberaad article discusses how Raalte has "a high percentage of bicycle use without any clearly visible reasons". When I read this article, I immediately thought this was the type of press-release from the Fietsberaad that was ripe for quoting out of context by that special breed of cycling campaigner who is against cycle-paths. David Arditti pointed out this morning that this has indeed happened. The cafe is on the edge of a pedestrian area, which as is normal in the Netherlands also allows bicycles. While sitting there, any number of bikes went past. It is not a busy through route for cars. Note that just like elsewhere in the country you can see all age groups cycling and especially children cycling on their own, with the high degree of subjective safety necessary to make this a reality. For the Netherlands, this infrastructure, joining up everything, is just considered to be normal. You can go to any town in the country and find this cycle paths and roads prioritized for bikes which link up everything. Elsewhere, this would be exceptional, but for the Dutch, this is not something to make a fuss about. That is what the article is trying to say - that the town has had success with promotion of cycling given normal infrastructure for cycling but without any extra special big projects for cyclists. It's misleading to think that Raalte used only "audacity" to achieve a high cycling rate. Like anywhere else in this country, the infrastructure of this town emphasizes cycling as a means of transport in a way you don't find outside the Dutch borders. Please don't make the mistake of believing that the "audacity" mentioned in the Fietsberaad article has anything at all to do with promoting cycling in other countries. It doesn't. Only when you already have the extensive and well designed infrastructure can you can say you don't have to do much to get people to cycle. They're starting from a completely different base here. Please read Mark Wagenbuur's comment which goes further in explaining the headline is a case of an unfortunate translation of the original article more than anything else. We offer study tours in order to help to educate people about real cycling policy. We show what truly works as well as demonstrating what does not. Lessons are learnt from both these things. Because we're native English speakers we do not suffer from the translation difficulties which can otherwise occur. Like the rest of the country, Raalte isn't perfect, of course. I found an obstruction there last year. However, that wouldn't have been possible if not for the fact that the cycle paths existed, and one particularly pleasant one coaxed me into riding towards the wrong end of the town. What's that got to do with cycling? Well... why don't we stand on a street corner one such Saturday from 4 to 5 pm and see all the people coming back from that very shopping trip. The whole demography of a Dutch city cycles by right before our eyes! And it's pretty! Many people carry bags. A lot of the bags are just hanging from the handle bars. Officially that is illegal, but that would not be widely known. Note that all ages are represented. Not just the 20 to 40 year old commuting males. In fact that age group seems under-represented in this video. And, since this is a Saturday, hardly anyone is a commuter in this video anyway. Many children cycle on their own, some are even also unaccompanied. A great number of the cyclists are over 60, men as well as women. The weather wasn't very good that day, just 16 degrees (61F), it was very windy and it had rained off and on... but that didn't stop any of these people from taking their bicycles to go shopping. All signs of a healthy cycling culture. But it may be under threat. On June 22nd many people in the Netherlands became rather concerned by news reports that the European Commission would want to make it mandatory for all these cyclists to wear high visibility vests. For the Dutch an alarming thought. One Dutch member of the European parliament immediately stated: "This [report] implies that cycling is dangerous when in reality it is the safest means of transport. Cyclists should not be yellow canaries". Which from the Dutch view point is understandable. Just imagine all the people in the above video in those vests or even worse, the ones in this rush hour video. It would blind everybody! So is this really what the European Commission wants? It is always good to go back to the source of such reports. I found the press release and the message is not quite what it became in the Dutch press: "High-visibility reflective vests should be carried in vehicles for all occupants, say MEPs. Cyclists, too, should be encouraged to wear helmets and reflective vests after nightfall, they add". "Encouraged" and "after nightfall". So not mandatory and not at all time. Still, from a Dutch view point a ridiculous idea going against everything cycling stands for in the Netherlands, where road deaths have already decreased enormously by investing in good cycling infrastructure. 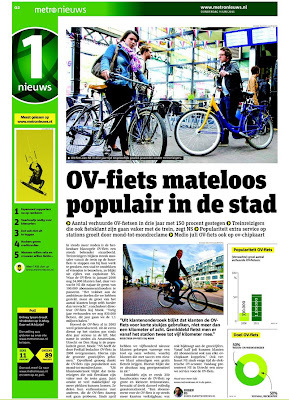 The popularity of the OV-Fiets (Public Transport bicycle) knows no boundaries. I have written before about this nationwide shared bicycle rental system of the Netherlands’ Railways. 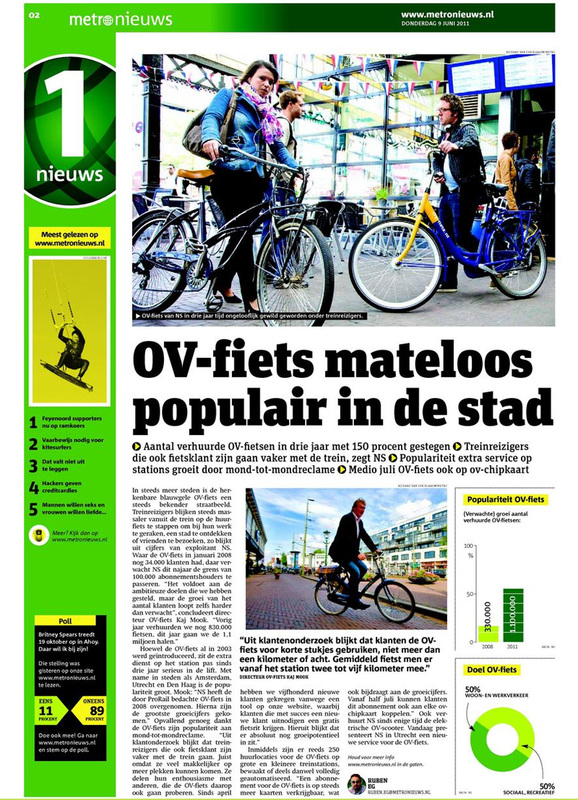 It made headlines again in the Dutch newspapers recently because the one million bike rentals per year threshold will be passed this year*. OV-Fiets expects 1.1 million round-trips** for 2011, up from 835,000 in 2010. Another mile stone: the number of subscribers will pass the 100,000 mark this year. Up from 34,000 in 2008 when the Netherlands’ Railways took over OV-Fiets. 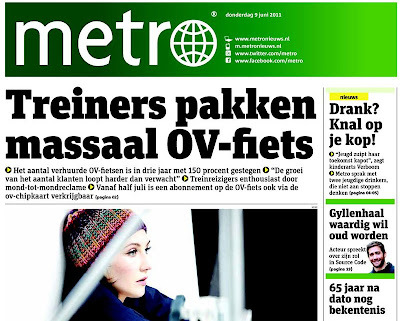 "Massive number of train passengers take the Public-Transport bicycle"
Investigations bring to light that OV-Fiets subscribers travel more by train, “because they can get to more places easily”. Sharing their enthusiasm with family and friends leads to more subscribers. "Public-Transport bicycle immensely popular in the city"
Interestingly enough this program is not recognised by the people behind the bike share world map. They keep the Netherlands as a blank spot in the world of bike share programs because they feel the OV-Fiets system doesn’t meet their description of: “short-term bicycle rental available at a network of unattended locations” by either “coin deposit” or “high-tech”. Many of the over 250 OV-Fiets rental locations in the country are indeed manned and thus attended. But a great number of the locations is not. In the video below you can see how the bike share system works at the railway station in the town of Heerlen in the extreme (and hilly!) South of the Netherlands. This is an unattended indoor bicycle parking facility. Where many people park their own bicycles but where you can also get your Public Transport bicycle, by use of electronics. As can be seen in the video it is not the bike that is stuffed with electronics, only the entrance into the facility and the way you get to the key is taken care of electronically. Apparently this is all not high-tech enough. Oh well, just another thing that many people in the world don’t understand when it comes to the extremely effective cycling measures in the Netherlands. * Although "one million trips per year" may seem like an awful lot, it is actually nothing of the sort. In the Netherlands people on their own bikes make "one million trips per hour". ** Other bike share programs are single-trips per rental. OV-Fiets is almost always a round trip (compared to two rentals in other programs) because usually you take the bike back to the initial rental point. While we are debunking figures here: just how ‘massive’ is massive? The Dutch Railways claim there are over one million train travellers per day. So that would be 365 million per year. These 365 million travellers make one million bike trips by OV-fiets. Doesn’t really sound ‘massive’ now does it? Especially compared to the figure of 40% of train travellers using their own bike to get to and from the stations. Bike share programs can be very convenient for an individual, but they will never really contribute to a higher mode share. Thousands of people took their bicycles and went to the beaches last weekend in the Netherlands. For many it was a long weekend starting with Ascension day on Thursday. The weather was more typical for August than for early June and so it was perfect for a day to the beach. Not only the North Sea but also most lakes in the Netherlands have beautiful sandy beaches. And they are often more easily reached by bicycle than by car. Which only enhances the relaxed atmosphere around these pleasant beaches. People on their bicycles around two of the city’s beaches in ’s-Hertogenbosch (a.k.a. Den Bosch) on Saturday 4th June 2011. After all the focus on infrastructure in our past few blog posts it is maybe time to see the people again for which all this infrastructure was built in the first place. It is obvious that Dutch cycling infrastructure is being used in high numbers and by people of all ages, all classes and all backgrounds. When you are used to taking your bike for your trips, be it for commuting or running errands, you are much more likely to use your bicycle for your leisure activities too. And nobody seems to be doing it on their own. You see families, friends, young and elderly couples, large groups, you name it, all on their bikes having a good time together. And doesn't it look good! Mike Rubbo sent me a link to this video by Ron Gabriel. It's very nicely made, and shows very dramatically the points of conflict which he saw over a brief period of time. However, I think the way Ron himself as well as other people who have commented on the video talk about what they see is quite telling. The discussion on Vimeo and on the blog is about "long-standing bad habits" of users of various modes, about "selfish people" and enforcement of the law. I don't see the behaviour at this junction as being about "bad habits". What I see is simply a very badly designed junction which almost invites people to behave in the way that they do. Dutch road junctions don't look like and work like this - the designs are different for a reason: A long-standing theme of Dutch road design is the concept of Sustainable Safety. Conflict is removed, collisions are therefore rare and the consequences of those collisions which remain are relatively small compared with other countries. Roads are made self-explanatory so that excessive signing is not depended upon to reduce bad behaviour but the way in which people behave is changed because of their environment. Less "enforcement" is needed when people have no reason to want to do dangerous things. This has resulted in the safest roads in the world. Simultaneous Green lights for cyclists, keeping cyclists and motor vehicles apart. Roundabouts designed to keep modes apart. Most of these examples deal with cycling more than other modes. The others deal with pedestrians. There are reasons for this emphasis. It's quite common in other countries that cyclists are singled out for more criticism than other groups. There is a reason for this. While there are sidewalks for pedestrians and roads for drivers, cyclists have no true place of their own and are left with a choice of "sharing the road" rather unequally with motor vehicles or riding illegally on the sidewalk. Cyclists are an out-group not only in social terms but also in terms of road design. Road design overall is in general rather too dominated by motor vehicles. That's certainly the case in New York, and while New Yorkers walk quite a lot, conditions for cycling remain poor. This contributes to the still very low cycling rate of the city. There is an inadequate level of all three types of safety for cyclists and the lack of subjective safety is especially clear from watching the video. Even amongst those who are brave enough to cycle in the city, few would want or encourage their children or grandparents doing the same thing. There is a solution to this problem, but it doesn't come from maintaining the design status quo while enforcing rules. Design of infrastructure needs to change to reflect the usage which you want to have and to encourage people to behave in a safe way. It's especially important at intersections. Our local paper reports that Drenthe, the province of which Assen is the capital, has been voted as cycling province of the year for 2011. "Recreational cyclists find Drenthe the most attractive". One of the areas of Heath in Drenthe. Beautiful, and with no motor access. 5000 people voted in an online poll, giving a score for such things as the attractiveness of the countryside and the quality of cyclepaths. Drenthe scored well due to the amount of space (it's the least densely populated part of the country) and quietness. Talking to a customer in May in one of the ten Stiltegebieden or "silent areas" in Drenthe. This place is about 10 km from Assen and can only be reached by foot or by bike. It's very nearly completely silent. You have to get off your bike and stop to notice this. Usually you can't hear anything at all. Drenthe really is a fabulous place to cycle. That's why we moved here. We organise cycling holidays in Drenthe. Before we moved over here, something that impressed me on visiting was that so much infrastructure was new, and that each time we visited we would see a change since the last visit. Huge projects seem to manage to get completed on time and to a reasonable budget here, very much in contrast to where we lived in Britain. Cycling from the outskirts by the ring-road to the centre of Assen on a nice sunny Saturday along the Vaart NZ bicycle road in Assen. On the bicycle road, the first 4:10 of the video, there were 59 bikes, three cars, two mopeds. On the other side of the canal, the main route for cars and a secondary route for bikes, there were 15 cars and an unknown number of bikes. I'm not going to even try to count the bikes in the city centre. One particularly impressive piece of work which we've seen in Assen since we moved here is the renovation of the Vaart, a canal from the western edge of the city to the city centre. This stretch of canal is 2.5 km long, and 1.5 km of it was moved sideways by two metres in order to make the Northern side narrower and the Southern side wider. This had to be done because more space was needed on the Southern side in order to provide both a good quality segregated cycle path as well as pedestrian space, residential car parking and a route for drivers. The Northern side could afford to be a little narrower as it was to become a bicycle road and would no longer function as a through route for drivers. The red line shows the extent of the works. As well as the work to move the canal itself, the road was completely reconstructed on the South side of the canal and some of the North side of the canal and extensively reworked on the rest of the North side. The work also required a large bridge to be constructed to carry cars on the dual-carriageway ring-road over the cycle path in order to keep the cyclist route uninterrupted, as well as two new lifting bridges for cars and bikes, one new bridge for bikes only and moving an historical bridge into a position where it could be used by cyclists and pedestrians, but block motor vehicles. The public face of the works was this humorous map. Zoom in to see individual cartoons of different aspects of the work. While work was carried out, two temporary bridges were constructed to maintain routes for cyclists. 15th October 2007 - The sidewalk and cycle path on the Southern side of the canal are now usable though the road has not yet been started. At this time, I spoke to someone in the council office about how impressed I was with this new cycle path. He told me it was just the secondary route, and that the bicycle road on the Northern side of the canal would be the primary route for cycling. 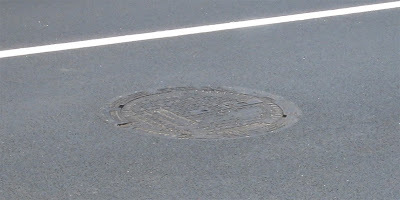 At the time the photo was taken, only the first layer of asphalt, black, is on the cycle path. 8th April 2008 - After the existing crossings of the canal were removed, two temporary cycle bridges were put in place to maintain cycle routes across the canal. This is important as if people stop cycling it may be difficult to get them to start again. There are many examples of cyclists being helped around roadworks on this blog. 13th April 2008 - This is the second temporary bridge which maintained cycle access during the works. This bridge existed on the North side of the Vaart until the late 1970s, when motor traffic levels became too much for it. This photo, taken in 2007, shows the same location from the 1970s until 2007. At this time it was was prioritized for motor vehicles. Another blog post shows a different view of this bridge. View from the city centre of the end of the canal in 1960 and 2007. This had originally been the "Kolk" - a wide part at the end of the canal large enough for boats to be turned around. However, it was filled in and used as a car park. A previous blog post shows what it is like to cycle from here to the centre of the city. Works to the right of this photo are ongoing to build "De Nieuwe Kolk", which will combine library, theatre, cinema and arts facilities in an easy to reach place. This will include some underground car-parking facilities, in part to replace what has been lost here. This is just one of the larger projects which have been completed in Assen since we moved here. The city is now in the planning stage for completely renovating another canal. The photos from 2007 and earlier come from "Assen Verandert" - a book showing a lot of "before and after" photos which we reviewed three years ago. The title of the book means "Assen Changes", and it continues to change, meaning that a surprising number of 2007 images are now also representations of the past. This blog post does not show an example of good cycling infrastructure. Please see the note at the bottom of this guest blog post which explains why. The red of the cycle paths and lanes in the Netherlands is really standing out. It makes clear where the realm of the motorists stops and that of cyclists starts. Some people think the red is paint but that is not the case. 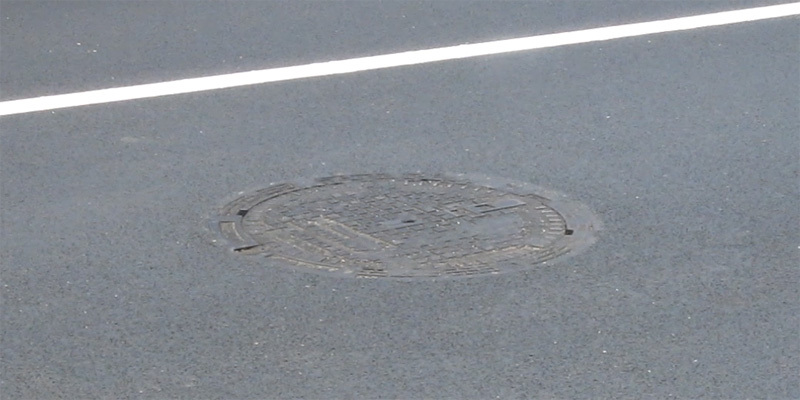 It is actually a thick layer of very smooth red asphalt. 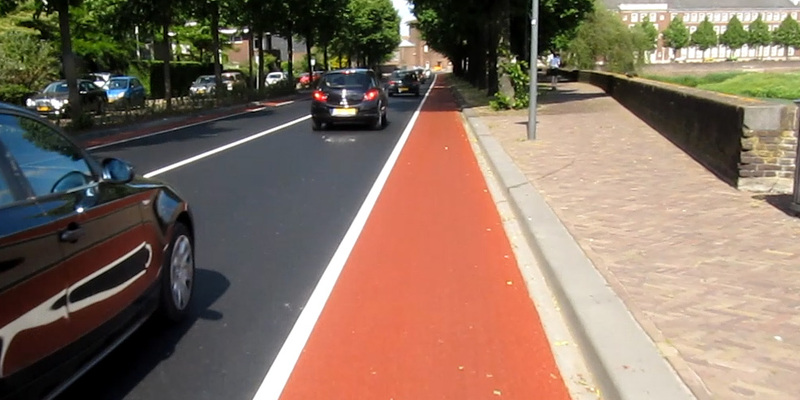 The video below shows how a Dutch street with separate red cycle lanes is created. Four rolling machines were needed for this street. Two roll out the red asphalt for the red cycle lanes and two the black asphalt for the lanes for motorised traffic. 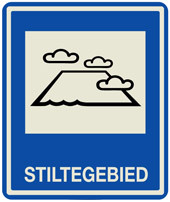 The road was resurfaced because it wasn’t up to the very high Dutch standards anymore. Workers spent about two weeks scraping off the old top layer and then in one weekend the four machines rolled out the new top layer in a single sweep. According to the local newspaper about 700 metric tonns of asphalt for the 1 kilometre long street. The road is now very smooth again and the cycle paths are very clearly marked with a un-interrupted white lane (which means motorised traffic may never enter the cycle lanes, so there is “no stopping at any time”). A before-and-after ride from beginning to the end of the resurfaced street. While Mark thought this facility worthy of praise, I'm less sure of its merit. I think it's unhelpful to show examples of infrastructure like this to a global audience as this gives the impression that on-road cycle lanes are a worthy type of cycling infrastructure. Such lanes do not keep cyclists safe in the same way as do cycle-paths away from the road and in many cases their existence excuses having not unravelled motor routes from cycle routes. parked on it than on the road. In the Netherlands just as in other countries, lower quality infrastructure such as on-road lanes are associated with less pleasant and often more dangerous cycling. 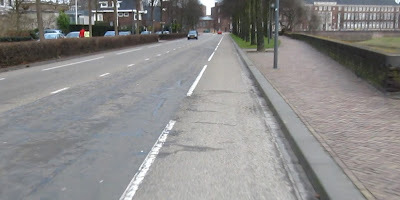 Please see a future blog post which illustrates how all the problems which are caused by building on-road cycle-lanes elsewhere happen just as often in the Netherlands. Please also read a blog post showing actual red carpets used to preserve space for pedestrians in a city full of bicycles. For racing, when you might actually care whether the pressure in your tyres is up to the maximum and want to measure them, there is ab advantage of the Presta ("French") valve over the Schrader (car type) or Dunlop (also known as Dutch or English) valves. Also, as everyone else will be using these, if you borrow a pump it will already be set up to fit these valves. In the Netherlands, there are sometimes publicly accessible pumps designed to accommodate the Dunlop valve, and you can buy very well priced floor-standing pumps which make pumping these up very easy indeed. For everyday use, these valves are very convenient. However, I might feel differently if this was the most commonly used valve type where I lived as the convenience would then be on the side of the Schrader. In the US, these seem to be the most popular valves in use.